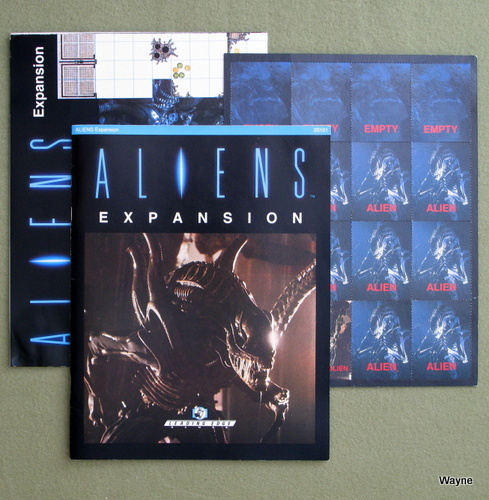 Apart from its cinematic qualities, the Alien series makes for great inspiration & source material for a 2300 AD game. Especially James Cameron's Aliens movie, which bears an uncanny resemblance to the 2300 universe... or is it the other way around? Chock-full of color stills from the movie. 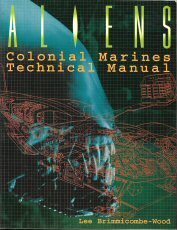 "An official guide to the technology of the United States Colonial Marines shares detailed diagrams and technical schematics; a close-up look at the guns, vehicles, and ships of the USCMC; and a hypothesis of what could have gone wrong on the colony planet known as LV-426." The Aliens Adventure Game can elicit negative reactions from modern gamers, repelled by its rule complexity. RPGs published in the last 10 years have had their emphasis on background and ease of play. Now that pen-and-paper RPGs must compete with video games and MMORPGs, woe to the RPG that slows down play unnecessarily. This wasn't always the case. RPGs evolved from wargames, which typically had reams of rules eagerly consumed by the players. 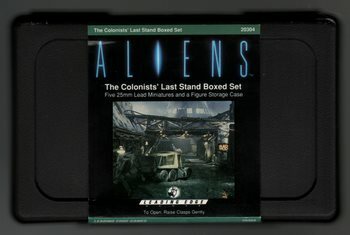 The Aliens Adventure Game was published in a time when you could write a simple computer program yourself in BASIC, print it out on your tractor-feed printer, and give it to your buddy. So ignore the rules. What's left? Plenty. The background is based on the first two movies: Alien and Aliens. And the authors flesh out this rather paltry source material with some of their own extrapolations, which you may or may not like. I feel it maintains the spirit of the Aliens universe. Chapter 4 goes into detail about the Aliens. Background, Life Cycle, Metabolism, Lairs, and the infamous Facehuggers. But this book really should have been titled "The USCM Adventure Game," except that few would have understood what that meant. Chapter 3: Setting is 37 pages of source material intended to take your USCM character beyond traditional Alien-hunting and to other worlds, other problems. Creating Marine strike teams, missions, and what happens when the mission is over. Other sectors of space, other worlds. Page 59 has a map of settled space, and several of the worlds are described in the pages that follow. My favorite is Tartarus, which has a 20-year day, and a 20-year night. It has been recently plagued by the Harvesters, enormous armored, burrowing animals that are ruining a once-prosperous colony. Chapter 5 describes equipment that USCM characters would encounter, from hand-held sensors to frigates and warships. Chapter 8 suggests scenarios, campaign settings and mission ideas for referees. One of the aspects of the book that I love are all the movie quotes in the sidebars. "He's dead. You're dog meat, pal." (Hudson). 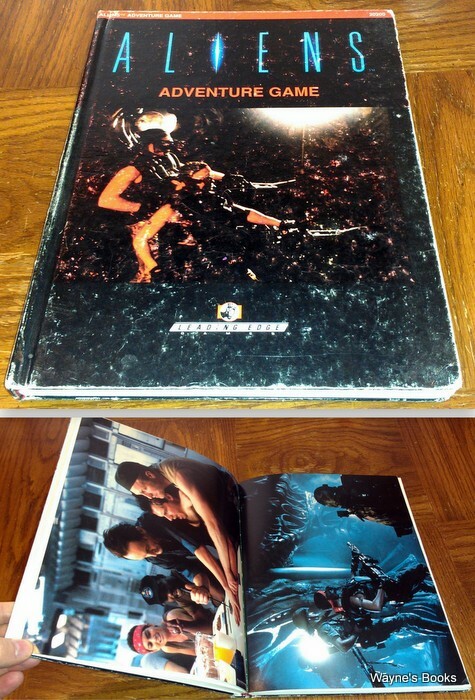 The sourcebook is graced with numerous B&W stills, as well as 8 gorgeous pages of color photos from the Aliens movie. So I view this book as more of a resource, a mine of material, than a ready-to-play game. 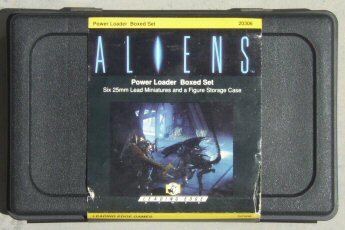 And seen in that light, my personal copy of the Aliens Adventure Game will always have a place in my RPG collection. I've ran across a Hardcover edition (Jan 16, 2013). Other than being hardback, it is otherwise identical to the usual softcover Aliens book. Now you can be a part of the danger and excitement of the hit movie ALIENS, from Twentieth Century Fox! 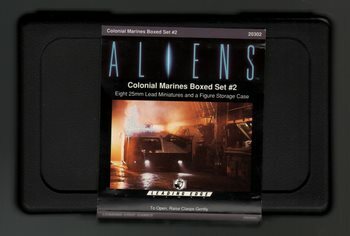 From the ruins of the Colony that was destroyed by the Aliens to the chaos and greed of Earth itself, the ALIENS Adventure Game pits you against Aliens, other dangerous lifeforms, and corrupt Humans as you find out what it takes to be a member of the Colonial Marine Corps. 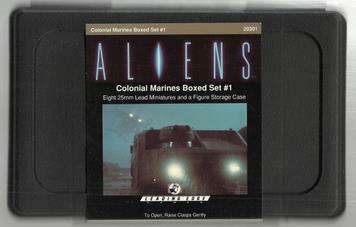 The accent of the game is on the Aliens, of course, but there is far, far more. For those who want to go beyond the Aliens and the Corps, there is a whole galaxy of deceit and danger in the bleak Corporate future of the ALIENS storyline. Try your hand at one of the other possibilities offered; corporate mercenary, explorer, businessman... your choices are limited only by your imagination. 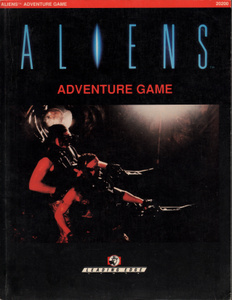 The ALIENS Adventure Game prominently features full color and black and white art from the movie, as well as fast, fun game mechanics. 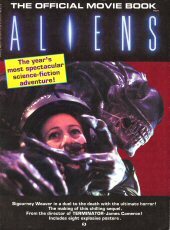 Fast paced and intense, ALIENS is sure to thrill anyone who enjoyed the movie. * The ALIENS - Abilities, Metabolism, and Scenario Ideas." • The Map, which is 17" x 34"
There are a number of places in the rules where the term "Marine" is used. In all cases this term applies to all the humans, including Ripley, Burke, and Newt. Players may determine who controls which Marines by any method they wish; by dealing out Marines for the Scenario at random, by taking turns choosing Marines, or by mutual agreement. When the rules state that a Marine may make a choice, or roll a die, it obviously means that the controlling Player should act accordingly." 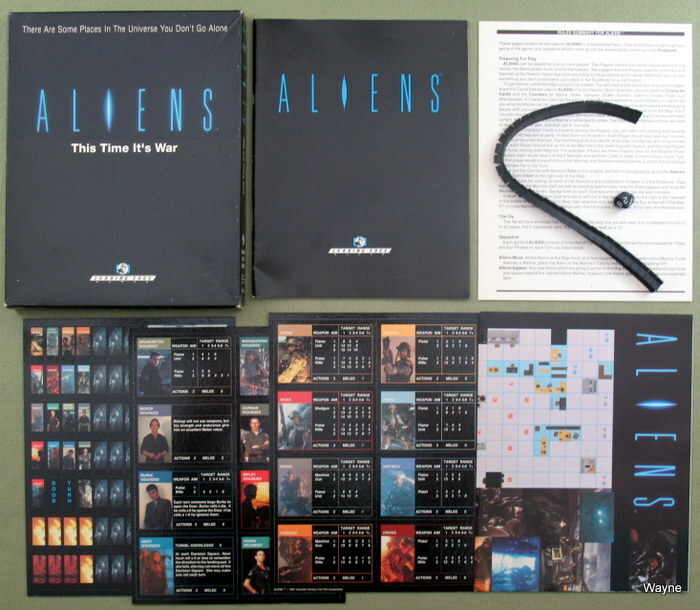 "This supplement to the ALIENS Boardgame takes players deeper into the situations in the movie, and features new Scenarios and options. * An entirely new, full color Map, 17" x 33". * New Cards, to determine the inhabitants of Alien lairs. * Scenarios for the battle on board the Drop Ship, Ripley's rescue of Newt, an attempted rescue of Apone and Dietrich, and a complete Hunt for the Alien Queen. * Expansions for the Movie Scenario, allowing the Marines more options and greater challenges. * And a variety of new rules, including Ammunition Restrictions, Backup Weapons, and Tournament Rules." 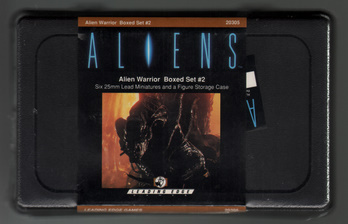 6 25mm Alien warrior miniatures. 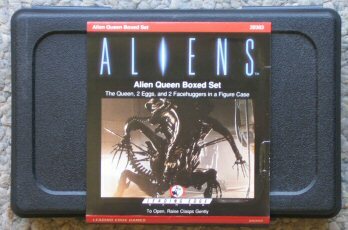 "The Queen, 2 Eggs, and 2 Facehuggers in a Figure Case. Five 25mm Lead Miniatures." 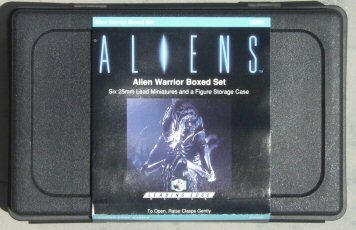 "Five 25mm Lead Miniatures and a Figure Storage Case"